Heiichiro Ohyama studied violin and chamber music at the Toho Music High School and College under Toshiya Eto, Saburo Sumi and Hideo Saito. He graduated from London's Guildhall School of Music and Drama in 1970 studying under Yfrah Neaman, William Pleeth and Thurston Dart. He then entered Indiana University where he studied viola with William Primrose and violin with Josef Gingold, Ruggiero Ricci, Franco Gulli and chamber music with Janos Starker, Manaham Pressler. He later taught as a Visiting Lecturer at the Indiana University. As a student, he won the Music Competition of Japan (1966), British Council Music Scholarship (1968), Carl Flesch International Violin Competition (1968), the BBC Beethoven Competition (1969), as well as both the violin and viola competitions at Indiana University (1971). In 1974, he won the Young Concert Artist International Audition Award of New York and after being a participant of the Marlboro Music Festival for several summers, he became increasingly in demand as violist and has performed throughout the United States and abroad. He was also Professor of Music at University of California since 1973 to 2002. In 1979 he was named Principal Violist of the Los Angeles Philharmonic under Carlo Maria Giulini, a position he held for 13 years. In 1990 he has recorded Mozart String Quartets with A.Previn on the RCA. Now he holds the position of the member of ”The Chamber Players”. 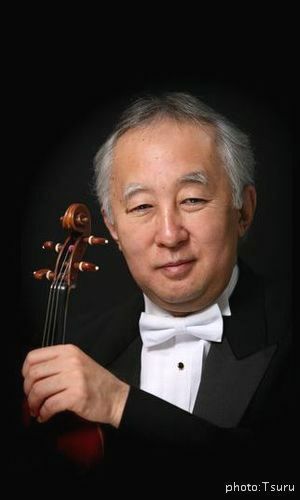 Heiichiro Ohyama has participated as a chamber musician at many festivals including Casals Festival, Kuhumo International Music Festival(Finland), Johannesen International Music Festival(Canada), Okinawa Moon Beach Music Festival(Japan), Brescia and Bergamo Festivals(Italy), Chamber Music Northwest, Sarasota Music Festival and Caramor Chamber Music Festival. He has collaborated with many great musicians including: Emanuel Ax, Myung Whun Chung, Lynn Harrell, Nobuko Imai, Gidon Kremer, Cho-Liang Lin, Jaime Laredo, Radu Lupu, André Previn, André-Michel Schub, Takahiro Sonoda, Isaac Stern, Kyoko Takezawa and Pinchas Zukerman.